Like U Mobile Facebook page and fill in the entry form. Answer as many trivia questions correctly within 30 seconds. Share out and invite your friends for more trivia rounds! 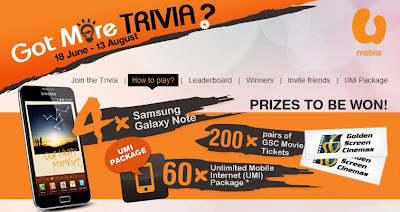 Only active U Mobile prepaid subscribers are eligible to win any prize. Visit U Mobile Facebook fan page for more details. Win the new iPhone 5. Yes, the yet-to-be-released iPhone 5!! Here's how.